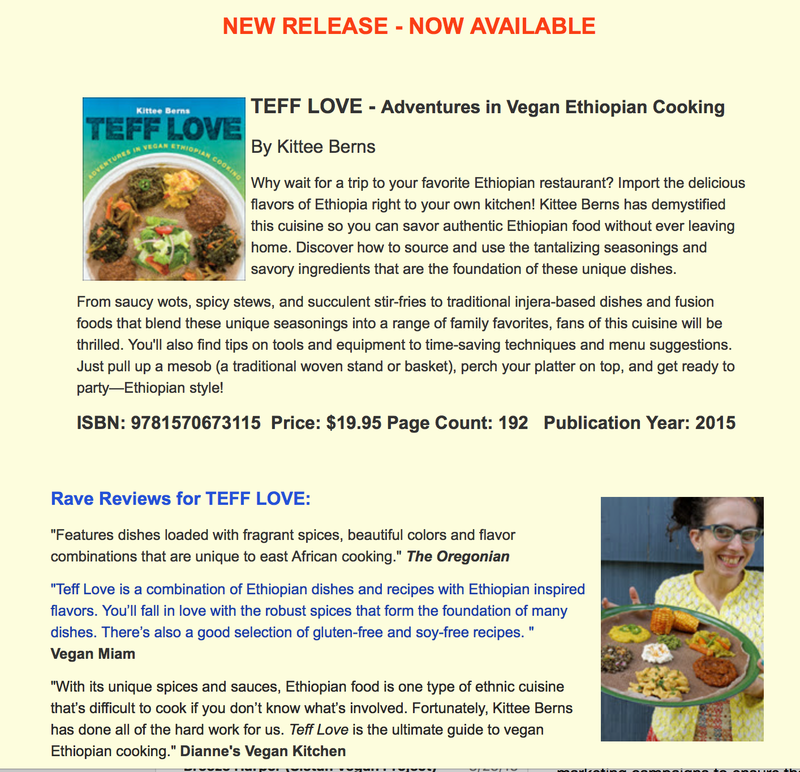 Earlier this year, I received a newsletter about the announcement of a new cookbook, Teff Love. After reading the marketing language for this new book, I decided that I would send the publishing company some of my thoughts ( which come after the snapshot I took of the newsletter below). First of all, I absolutely am not bashing the work and love that was put into Berns’ book and successful blog. As someone who has written and published manuscripts, I know that it takes a lot of work, time, etc for achieving such an end product. Instead, my focus for this post is looking at the communication style employed when marketing a book about Ethiopian cuisine and the assumptions made about the audience; I am curious about the ease in which terms like ‘demystify’ are used for non-White cultural foods. I emailed the letter below to the publisher on April 1, 2015, after emailing them in March. I never heard from them and assume that they are incredibly busy with work and life, so I’m not upset or anything. And let me give you another reminder that I am approaching analysis of the announcement of the book as a critical food studies scholar influenced by critical race feminist methodologies. I am using the advertisement as an exercise to explore unconscious bias within the mainstream ‘post-racial’ ethical consumption movement. Ultimately, I hope that it will be a useful tool for anyone who thinks about marketing cookbooks written by white people with culinary interest in non-White Eurocentric food ways. My letter explores how exotifying certain non-white people’s cultural foods may be received as cool to the mainstream [white] vegan audience but triggering and traumatizing to those in the USA who are non-white and may even be non-white immigrants who are constantly reminded how they are exotic and don’t belong in a USA obsessed with giving full human-ship and citizen ship to white people. After the advertisement for Teff Love was released, there were quite a few conversations happening among vegans of color on Facebook. Many explained that they found the marketing language of Teff Love to be problematic and frustrating; some folk talked about how a rather well know Afro-Caribbean vegan chef, known for only writing books and giving lessons about Caribbean cuisine, was unable to secure a cookbook deal for writing about French cuisine… because the publishers didn’t think an image of a Black woman could sell books about [white] French cuisine (yet, for some reason, white people are normally not told they can’t publish a cookbook about recipes that are non-white Eurocentric). This spurred a conversation about who is allowed to be an ‘expert’ on culinary practices and who isn’t…and what racial bias (implicit or overt) has to do with all of this. Below is the letter I sent to Book Publishing Co.
Congratulations on the new book release. I was wondering why the news release is worded the way it is. Is the audience assumed to be non-Ethiopian? Just wondering if the language used could be more mindful when talking about non-White cuisines. Words such as ‘demystified’ position Ethiopian cuisine as something that needs to be made ‘accessible’ for a supposedly and assumed non-Ethiopian (most likely white) audience of vegan cooking folk. When this new release came out, quite a few of us in the vegans of color community noted that though well-intended, the advertisement is worded in a problematic and culturally appropriating way. We were wondering why the cultural authority to ‘demystify’ a non-White cuisine ( that isn’t mystical to many of us who may have Ethiopian ancestry/are Ethiopian) is given to a seemingly white author; it’s not that white people cannot write books about Ethiopian or other non-white/non-European cuisine. Our concern is that too many times, white chefs and cookbook authors are uncritically allowed to write about any cuisine in the world while non-white cookbook authors and chefs are usually limited to only writing and publishing a book about cuisine from their racial/ethnic group (i.e. Black people write about ’soul food’ but it would be hard for them to find a publishing deal if they wrote about French or German cuisine). Harper, A. (2011). “Knowing, Feeling, and Experiencing the ‘Exotic'” in Alkon, Alison and Julian Agyeman. 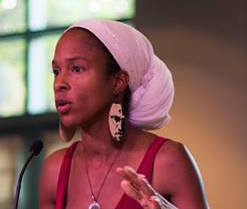 Cultivating Food Justice: Race, Class, and Sustainability. MIT Press. Cambridge: MA. Just some food for thought for you to consider as you advertise for this new book. You may gain a wider audience/fans if your marketing staff can be more mindful of the nuances of ‘assumed whiteness’ and covert racism when using certain words and phrasing when promoting new books. It’s also often helpful to enlist the help of people trained in critical race, critical feminist, critical gender, etc studies to look over marketing campaigns to ensure that the language used causes the least amount of harm to marginalized populations. I do this almost all the time to make sure, for example, as a person with able-bodied and cis-gender privilege, that my writing does not uphold systems of ableism and transphobia. Of course no writing can ever be 100% free from discursive violence, but it’s helpful to alleviate it as much as possible. Thanks for your time and consideration of my thoughts. How do implicit biases, created by systems of oppression (racism, ableism, cis-sexism, classism), impact your cookbook writing and/or marketing? Even better, are you aware that most of us are untouched by implicit biases created by systems of oppression (racism, ableism, cis-sexism, classism) and that they impact your cookbook writing and/or marketing? How did your feel about this blog post and the letter I wrote? What were your initial responses and why? If you are a non-White person, have you ever experienced being exotified within the ethical consumption arena in the USA? If you are a white identified person, do you consider non-white cultures ‘exotic’ and ‘mysterious’ and why? Regardless of racial identification, have you ever thought about your response when learning, for example, and African American chef or cookbook author does not write about African American food, but something else? What has been your response when learning that a white chef or cookbook author has been labeled as an ‘expert’ for non-white ethnic cuisine in the USA? When asked to think about race and/or whiteness, as applied to food, what are your initial reactions and why? Is it new or something that you have already been thinking about? If you are a publishing company, perhaps you completely understand your market and maybe you know that the majority of your customers would respond more positively to phrases like “demystify” or “exotic” because you know the value and history those labels carry with that buying demographic. If that is the case, what are your thoughts on this letter? Do you find yourself having to make ethical sacrifices to make enough profits to keep afloat? Do you worry that integrating critical approaches to how systemic racism and other ‘isms’ impacts the culinary world (or whatever publishing world you are in that has nothing to do with critical approaches to systemic social injustices) may end up being “off-putting” to a majority that is thinking one-dimensionally about the topic being marketed? Thank you for this, and for the work you do! Am so impressed by how non-stop you are. 🙂 I am going to really try to take your questions on board in the way I write, esp. in certain projects that are coming up for me.